Includes a Foreword by Geoff Southworth, Deputy CEO and Strategic Director of Research and Policy at the National College for School Leadership in England. AER 53 elaborates on issues raised by the ACER Research Conference 2007: The Leadership Challenge - Improving learning in schools. 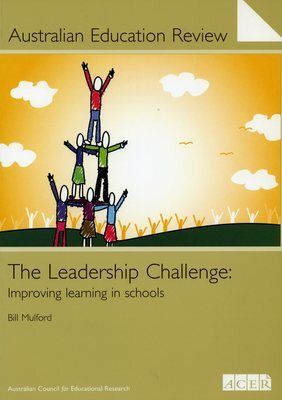 This conference was significant in that it identified leadership as an area of interest to school leaders requiring explicit policy development at both a school and system level.This review aims to demonstrate that a great deal of a school's success depends on which areas of school life the educational leader chooses to spend time and attention. Section 1 describes the three interrelated, or nested, elements of leadership. Beginning from the outside and moving inward to the core these are: school context, school organisation, and the school leader. Section 2 focuses on the school context, with reference to the forces that are currently pressing on schools, and the implications these have for schools and their leaders. Section 3 examines school organisations and looks at evolving models such as communities of professional learners. Section 4 concentrates on the school leader, questioning whether one type of leader fits all and what it means to be a successful leader. It also examines issues of leader recruitment and retention; leadership in pre-retirement, or small schools, or high-poverty communities; leader autonomy and responsibility; and new shared models of leadership. Section 5 provides a range of recommendations and the challenge to school leaders that they move beyond mere technical competence and be contextually literate, organisationally savvy and leadership smart.